With a reinforced bottom and long, sturdy handles, our large tote bag (or Tote ‘Em Bag) is strong enough to carry all your essentials. 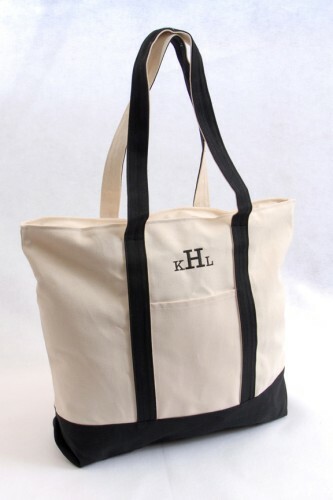 Great for the gym or for a short trip, this personalized black and tan tote bag has a zippered closure for keeping items safe and a handy outside pocket for keys or cell phone. Black embroidered monogram completes the look. Measures 21 3/4" x 17" x 5 1/4". Personalized with three-letter monogram (first initial, last initial, middle initial) in one of our 10 signature thread colors.